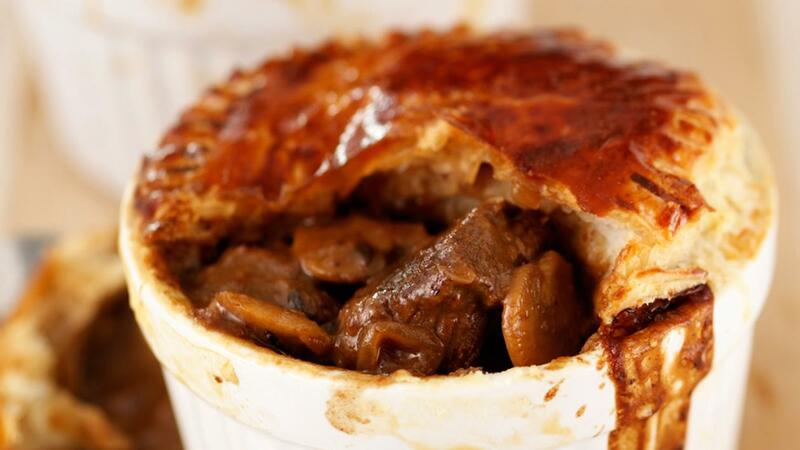 The classic steak and ale pie is a British classic and a must for all pubs menus. Make sure you meet your guest's expectations on taste and keep your kitchen profitable with this practical recipe. Prepare the individual pie dishes. Season the pieces of the steak with the KNORR Professional Garlic Paste then toss in the flour. Remove the steak from the flour shaking off any excess. Reserve excess flour for later in the cooking. Make up the KNORR Roast Beef Bouillon Paste by whisking into the water when it is boiling. Heat the oil and FLORA Original then brown the meat. Add the button onions and mushrooms. Once brown add the sugar and flour the cook for 1-2 min. Add in the KNORR Roast Beef Bouillon, ale, thyme and bay leaf. Bring to a simmer and cook until the meat is tender. Roll out the pastry on a lightly floured surface and cut slightly larger than the individual pie dishes. Evenly load the dishes with the pie mix. Place the pastry lid on top and crimp the pastry into the side of the dish. Brush the puff pastry lids with the egg. Cook for 30-35 min. or until the core temperature has been met. Serve with creamed mash potatoes and seasonal greens.